A Ugandan man hospitalized in Germany for the Ebola virus was treated with a biofiltration device that the creators believe will change the landscape in the fight against viral pathogens. The Aethlon Medical team has created a device called the Hemopurifier, which works on the established infrastructure of dialysis machines already located in hospitals and clinics. “It works within a dialysis machine, but the mechanism selectively targets viral pathogens and immunosuppressive toxins that they release,” James Joyce, the CEO of Aethlon Medical, told FoxNews.com. The Hemopurifier is an extracorporeal biofiltration device that converges hollow-fiber filtration technology with immobilized affinity agents to allow for the rapid physical removal of virus and soluble viral glycoproteins from the blood. It mimics the natural immune system response for clearance of circulating virus and viral toxins before cells and organs can be infected, according to Joyce. “Our goal is to eliminate the circulating viruses and do it on a rapid basis,” Joyce said. “The virus that we capture then remains in the [device’s] cartridge,” he said. Doctors at University Hospital Frankfurt had been following the clinical trials and the device’s technology and reached out to Joyce’s team. “We were contacted by physicians at Frankfurt University hospital on advice that they had an advanced-stage Ebola patient arrive at their hospital,” Joyce said. Aethlon had to seek special approval from the German regulatory authorities in order to ship the piece. “Hemotherapy was administered on day 12 after diagnosis and at that point in time he had multiple organ failure,” Joyce said. The patient was administered hemotherapy treatment for more than six hours and had no adverse effects. The physicians measured data points related to the treatment. The patient was monitored for changes in viral load, with the hope being for a reduction. Before treatment, the viral load was measured at 400,000 copies per milliliter for the Ebola virus. At the end of treatment physicians measured a reduction to only 1,000 copies per milliliter for Ebola. The patient is now free of the virus. The FDA has approved an investigational device exemption for the Hemopurifier, which the creators see as an advancement of feasible studies in relation to use of the device in the U.S.
“You can’t recruit patients for obvious humanitarian reasons, so you’re limited to demonstrations of safety,” Joyce said. “In our case we can conduct replicative studies to demonstrate the ability to eliminate the targeted virus in a closed loop,” he said. The company has run clinical trials overseas in patients with Hepatitis C and HIV. 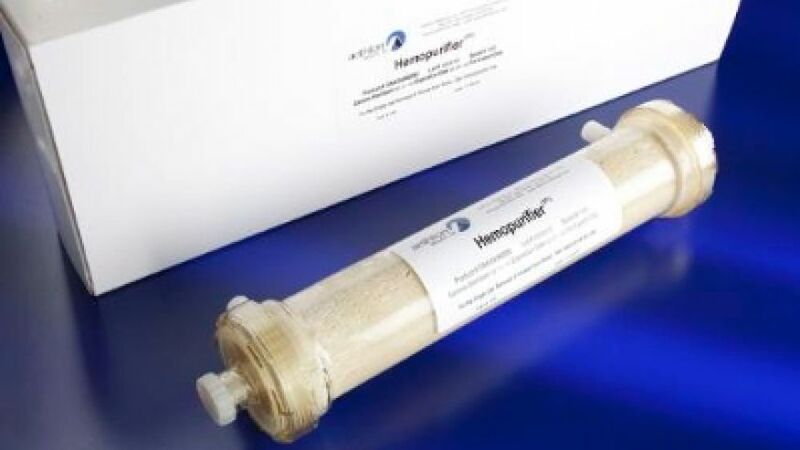 The creators believe what sets the Hemopurifier apart from treatments currently available is that it doesn’t add any additional drugs to a patient’s therapy. “Think about how fast the Ebola virus can replicate, and at a certain point in the disease there’s a great advantage to single therapy [treatment]” Joyce said. The World Health Organization reports that more than 5,000 people have died from the Ebola virus, and that it has infected more than 14,000.